IMPORTANT - Restrictions on use Must not be used for training. Always ask at Charlesground Farm (SD119921) before flying. You can leave a note with your mobile number if nobody is home. Lambing season is not necessarily a problem as the sheep are taken off the fell. Tupping time (generally November) may be an issue however so always ask. You can drive up to top in off road vehicle (not when wet) please ask first. Use Corney Fell pass road. Site overlooks east side of A595 and Bootle. See map for parking areas. From the East: Go past Broughton In Furness on the A590 down the hill and over the Duddon Bridge. 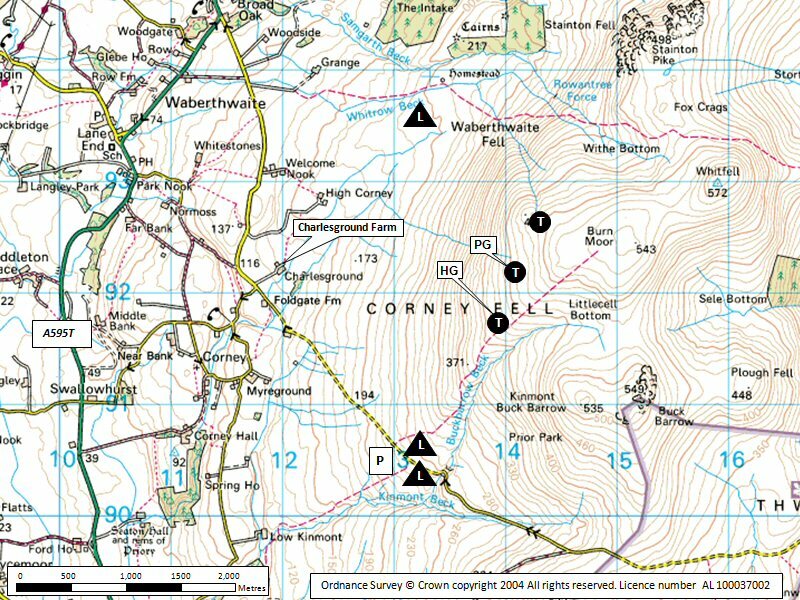 Take the next right to Coney and follow this road over the highest point and down the other side to the parking area which is on your left 300yds past the Buckbarrow Bridge, a small concrete bridge with metal sides on a double bend in the road. Look for a bridle path sign and park off the road on the left where the bridle path crosses the road. The ground is normally good here in all weathers. From the West: Turn left of the A595 to Corney Fell just uphill from Broad Oak. Follow this road to the parking area. Go across the cattle grid onto the fell. Watch for wooden bridle path signs, the car park is on your right at the second one. Beware of orographic cloud, it can set up quickly here in the right conditions because of the proximity to the coast. If you find yourself likely to be engulfed, fly south back towards the car park and down on the lower part of the hill or forward (west) and down. Public telephones are on the way to Bootle, down the hill and left just before Charlesground Farm. Or straight on until you get to the A595 turn right 100 yds on left near Broad Oak. No vices. Can be surprisingly smooth for an inland site. You can drive to the top in a good 4x4 if you have permission otherwise a long but easy walk. Study the maps of the area. Either take off area can be used depending upon whether the wind is NW or WNW, however the higher NW take off area may be a preference to PG’s in both wind directions. Safe for low airtime pilots but the hill is shallow and thus not easy to soar. You can interfly this site with Black Combe, the gap between the fells is a good test of the conditions and your skills. Its normally easier going to Black Combe than it is coming back as the car park end of the hill at Corney is very shallow and higher than Black Combe. On the return leg it can be best to follow the contour of the pass and use the hill behind take off, get your height there and then fly back across to the front. Bottom Landing is easy and everywhere, it slopes down slightly at the car park and in front of the WNW face. Even though this site is close to the coast and with no hills in front, a standing wave can set up here and extend across to Black Combe it is normally smooth and pleasant to fly in providing the wind is not too strong. As for PG’s. Be careful of the bottom landing at the car park end if the wind goes off to the west as it is then down hill into wind. Approach down slope of the road and slightly south of the car park area. Land uphill towards the bridle path or on the flat towards the NW on high side of the road. There is a large flat bottom landing area at the bottom of the far NW face. Beware of the gulley at the end of this area, its not obvious from the top. You can get close access to this area through Broad Oak off the A595 with a 4x4 but it’s an awkward retrieve and fairly boggy. Notes : On the A595 NW to the NW of the site. Colin reports that "the new owners are doing a fine job, good food, good service and not overly expensive"
Notes : A flight to Killington Lake mainly flown using convergence which set up above the Duddon valley through to Kendal. (not bad as a birthday treat).